Update: Camp registrations are now full and we would like to invite you to register for the wait list. Please read below for more details. May this announcement find you in the best of health and imaan! It is our pleasure to announce the opening of registrations for the long awaited YMWA Camp 2014! A three day long camp filled with fun & excitement to look forward to. With great delight we inform you that this year’s camp will be at Kokako Lodge in Hunua Ranges, with a wide range of new activities like never before! Camp registrations are now full. However, we encourage everyone to register as there are usually last minute changes that will allow you a chance to attend camp. All registration details are still required to be wait listed, but payment will only be requested if your spot is secured. All registrations are to be returned no later than 26th November 2014. Confirmation of space will only be received once full registration form (including parent/guardian consent & medical form) is received and a vacant spot is secured for you. After which, you will be asked to make payment within a set date. If any of the items are missing, spaces will not be held and you risk losing your spot. If you have any issues, please contact the camp registration team early! No refunds will be given if you change your mind. You must be 12-24 to attend this camp. 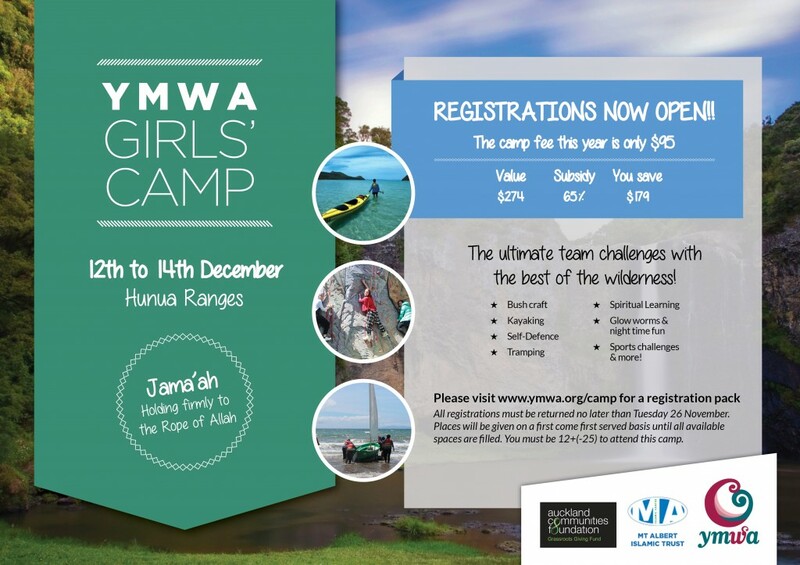 Please email ymwacamp@gmail.com for camp related queries. We hope to see you at Camp 2014 Insha Allah!